When I first started this blog I intended it to be a superfluous project that would supplement my gaming experience. I have been a gamer since I was a little girl but only recently has it developed into something that defines me as an adult as well. Non-gamer people in my life use it as a description of me when speaking in context, as in ‘my friend Jessica is a serious gamer’ and most of the time relate by remarking on the games their male friends, sons, or husbands are currently playing (something like Warfare?). Sometimes I feel like I am being affectionately humored about the situation-as if one of your adult friends suddenly declared that they decorate their rooms with nothing but Disney Princess paraphernalia or were heading out to trick-or-treat on Halloween. Your initial reaction may be “aren’t they a little old for that kind of behavior?” When I publically convey excitement about the newest Assassin’s Creed game or inform someone of my evening plans to conquer another major plotline in Dragon Age I see eyes shining with humor even while they are wishing me the best of luck. And this is to be expected. Most of my generation played games when they were children because it was the newest and shiniest of interactive technology. Super Mario Bros, Duck Hunt, King’s Quest-these are familiar names with distinct memories. But most of them outgrew it. 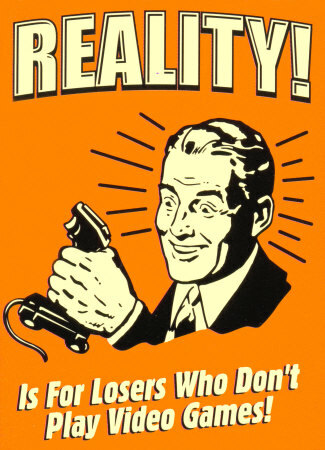 But I know there are many, many female gamers out there in my age group who not only proudly displayed their NES systems in childhood Christmas photos but who are also still obsessively gripping console controllers or tapping away at keyboards even while holding down 9-5 jobs and raising families. I smile at them when I pass them in the hallways of the Convention Center during PAX or read their blogs online. After almost six months of writing, I have come to realize that writing this blog means much more to me than just a place to reflect upon the games I play-it has become a tool I use to become a better and more informed gamer. And as any training program will tell you, it’s information that makes us more confident about who we are and what we do. When you have more resources and more knowledge to draw upon you create a more well-rounded experience overall. My first step in starting this blog was to add websites like Kotaku and Gaming Angels to my Google Reader. Media outlets always receive the breaking news first, and I wanted to as well. I use Kotaku as my main source because I find their contributors to be intelligent and humorous. Then I started researching various gaming podcasts, settling on the 1-Up Show and The Video Games Show w. Rick Bergin and Nick Kraftor for both their entertainment and content value. VGS has one of the more comprehensive News readings of any of the others I found, which is what I was most interested in. The Giant Bombcast is interesting, but their discussion format is lengthy and usually title specific, which wasn’t what I was looking for (although I did listen to many because I found the conversations fascinating). You see, although I have been enjoying video games my entire life I wasn’t familiar with the styles of the individual development companies or their histories. I just knew it was fun to move little Mario into the pipe to collect more coins and that Rapture was the coolest setting for a game I had ever seen in 2007. But in terms of this blog, I knew I didn't want to get the facts wrong-I could gray out the areas that were subjective with my own opinions, but the logistical facts are important. So I set out to use these resources to make me a more informed gamer. Plus I have a secret weapon-my boyfriend Matt is a veritable encyclopedia of gaming knowledge. In his unending support of my life as a gaming maven he is always willing to patiently give me entire timelines on particular companies and the games they create/develop/publish. He is always my number one source (for everything, really). In using all of these tools, both online and real world, I have now become a better gamer-even if I am playing the same way I was before. I am now more informed about the industry and all of its nuances. I know when games will be released and can build a gaming schedule around those dates. I know the media-only logistics of E3 and TGS and can predict what titles will be shown at PAXPrime. I can look at a game being played and quickly infer whether it is an action adventure, RPG or tower defense. I have come to love a FPS and a Western RPG. I broke away from being an exclusively 360 player for Heavy Rain because it was a PS3 exclusive and I didn’t want to miss out on an experience that was unlike any other. This wouldn’t have happened pre-blog as I was a stubborn 360 loyalist. Writing this blog has transformed me from a dabbler into a player. I can now have enlightened conversations with people about a popular game even if I have no intention of playing it. And not only is my confidence as a gamer building, but my confidence as a writer as well. I never thought I would utilize my college education to extrapolate on experiences in a virtual arena, but here it is. I have passively been trying to promote this blog in various ways via my friends and on the PAX Official Forums. I am not sure I am ready to really go out there and try to aggressively show it to strangers, but I am getting there. I joined the 1-Up community last night to peek into a community of bloggers writing exclusively about video games. I am hoping to be inspired by these like-minded individuals and so one day I can add my voice to the growing group of females with perspectives on gaming life. In the meantime I will continue playing, writing and learning.